Submitted by camerabob on Sat, 05/12/2007 - 9:17pm. POI Info: "Fatburger -- The last great hamburger stand"
Fatburger seems to be increasing their footprint across the globe in late 2013-early 2014, so you'll have to excuse me if there are any missing locations in the file. As usual any corrections sent to me are welcome if you spot any errors in the file. February 8, 2014: Refreshed the list from the contents of their web site. About: In 1952, Lovie Yancey created the biggest, juiciest hamburgers anyone had ever seen. 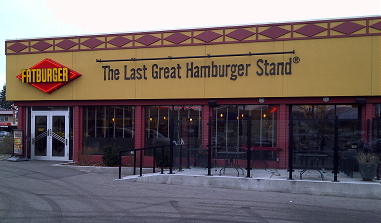 So obviously, there was only one name for them – Fatburger. Half a century later, while other places are just discovering taste, they're still making hamburgers the way she did. Fresh lean beef, not frozen patties. Cooked-to-order, just the way you want it, every time. The only thing Lovie loved as much as hamburgers was music, so you'll hear some of the best music ever blasting from kickin' new jukeboxes: Rock'n'Roll, R&B, Hip-Hop, and Classic Soul that'll keep you groovin' in your chair long enough to finish that big juicy burger. A few key Fatburger features: onion rings made from real onions. Hand-scooped, real ice cream shakes. Great tasting chili. And fries cooked in 100% cholesterol-free oil. All served with a smile. Fatburger: Distinctive seasonings and attitude since 1952. Removed closed locations, and added a couple of new ones. Added store hours to the descriptions as well. Confirmed most locations from Google Earth. Added better descriptions for those in casinos or malls. Added locations in the US and CA. Removed some old CA and NV locations. Removed some errant spaces from the file. Corrected the location for 1101 Harvey Avenue, Kelowna, BC. Thanks Juggernaut! Added 21 Canadian locations (& web site) I didn't know existed. Housecleaning, corrected comments field & general spelling. No coordinate changes. Originally submitted by etzvetanov on 5/12/2007. Maintained by camerabob since 10/26/2011.